Welcome back, sorry that I have missed a few, but we are back to reviewing comics every day! Today, Seppin is going to be reviewing Avengers #7 written by Jason Aaron and art by Sara Pichelli. Um… why am I still reading Avengers? I really did not like the last issue and I have plenty to say about this one. It is very mediocre. It has nothing to do with our heroes of the present and instead is continuing with the old Avengers from one million BC. I had hoped that this would have ended after the first story that was logically connected to the recent book, but no. They still want to tell the story fo these Jurassic Avengers and it is sad. It has basically taken over the main book to the points in which I prefer the old Avengers over the new team. As for the story this issue. It’s okay. I don’t mind reading about the old ghost rider, but shouldn’t that be in a Ghost Rider book? It doesn’t work very well here and it is blatantly obvious that Jason Aaron did not want to write for the Avengers book because he keeps trailing off on tangent stories. 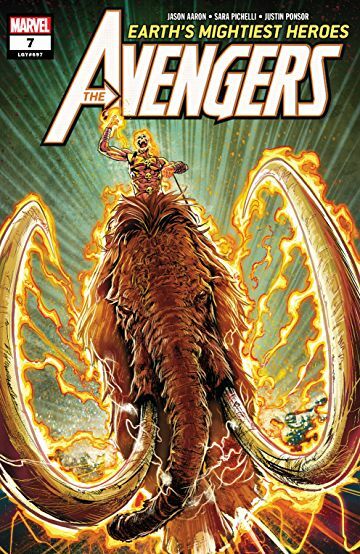 Plus, turning a mammoth into a flaming vehicle for Ghost Rider is a little too on the nose. It just looks ridiculous. Overall, this book is literal trash and I hope that some change comes VERY soon.